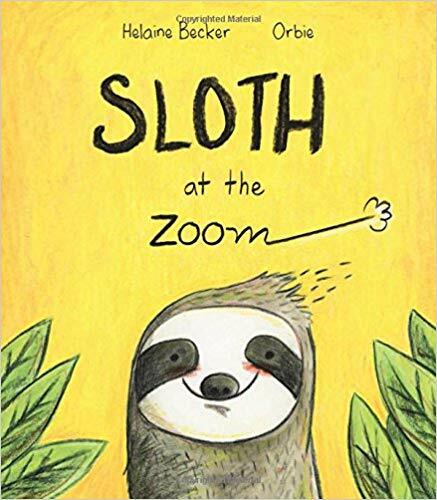 A sloth, heading for the laid-back Zzzzoo, is accidentally dropped off at the Zoom where zebras gallop aroud and cheetahs zip right by. How will she handle this fast paced life and will she be able to make friends? Full disclosure: I love sloths. I have a sloth stuffed animal collection. I have sloth socks. Even my roller derby name is Sloth. So naturally, I loved this book. The illustrations are really cute and vibrant. I feel like the illustrator did a good job of capturing each animal. The premise of the book is funny and clever. A type of jungle fish-out-of-water story. I especially enjoyed the descriptions of the animals zooming around–the zebras run so fast that their stripes fly off! I think kids and parents will find appeal in the idea that it is important to slow down sometimes. I also liked the underlying message that we can find friends anywhere, even if they like different things.